baeke.info – Cloud, IoT and more cloud. What else is there? In an earlier post, I looked at storing time-series data with TimescaleDB on Azure Database for PostgreSQL. To visualize your data, there are many options as listed here. Because TimescaleDB is built on PostgreSQL, you can use any tool that supports PostgreSQL such as Power BI or Tableau. Grafana is a bit of a special case because TimescaleDB engineers actually built the data source, which is designed to take advantage of the time-series capabilities. For a detailed overview of the capabilities of the data source, see the Grafana documentation. Let’s take a look at a simple example to get started. I have a hypertable called conditions with four columns: time, device, temperature, humidity. An IoT Simulator is constantly writing data for five devices: pg-1 to pg-5. Grafana has the concept of macro’s such as $_timeGroup or $_interval, as noted in the preceding image. The macro is translated to what the underlying data source supports. In this case, with TimescaleDB enabled, the macro results in the use of time_bucket, which is specific for TimescaleDB. Notice that the query uses time_bucket. The GROUP BY 1 and ORDER BY 1 just means group and order on the first field which is the time_bucket. If the query builder is not sufficient, you can click Edit SQL and specify your query directly. When you switch back to query builder, your custom SQL statement might be overwritten if the builder does not support it. Your dashboard will now update every 5 seconds for a more dynamic experience. You can join hypertables with regular tables quite easily. 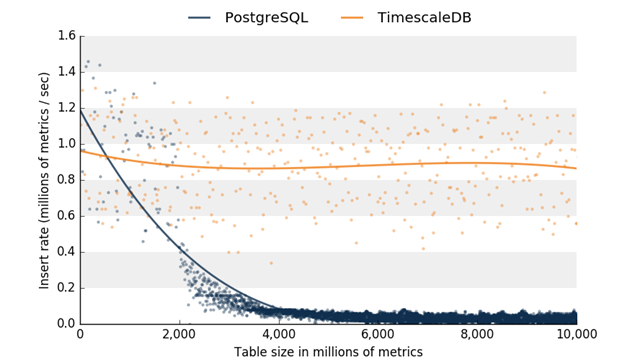 This is one of the advantages of using a relational database such as PostgreSQL for your time-series data. The screenshot below shows a graph of the temperature per device location. The device location is stored in a regular table. Grafana, in combination with PostgreSQL and TimescaleDB, is a flexible solution for dashboarding your IoT time-series data. We have only scratched the surface here but it’s clear you can be up and running fast! Give it a go and tell me what you think in the comments or via @geertbaeke! I decided to use the multi-tier deployment, which deploys multiple Grafana nodes and a shared Azure Database for MariaDB. Let’s take a look at the deployed resources. The database back-end is Azure Database for MariaDB server. The deployment uses a General Purpose, 2 vCore, 50GB database. The monthly cost is around €130. The Grafana VMs are Standard D1 v2 virtual machines (can be changed). These two machine cost around €100 per month. By default, these virtual machines have a public IP that allows SSH access on port 22. To logon, use the password or public key you configured during deployment. To access the Grafana portal, Bitnami used an Azure Application Gateway. They used the Standard tier (not WAF) with the Medium SKU size and three nodes. The monthly cost for this setup is around €140. Naturally, you will want to access Grafana over SSL. That is something you will need to do yourself. For more information see this link. It goes without saying that the template only takes care of deployment. Once deployed, you are responsible for the infrastructure! Security, backup, patching etc… is your responsibility! Setting up a multi-tier Grafana stack with Bitnami is very easy. Note that the cost of this deployment is around €370 per month though. Instead of deploying and managing Grafana yourself, you can also take a look at hosted offerings such as Grafana Cloud or Aiven Grafana.